Here is a nice lady, 56 years old from Phoenix, who requested plastic surgery after major weight loss. She lost 120 pounds after gastric bypass surgery 25 years ago and had plastic surgery in her past. At the consultation, in our medical office near Phoenix, Arizona she told me that her desire was to have tighter arms and upper chest, including a reduction in the bra rolls. She decided on a combined cosmetic surgery procedure. She decided on the posterior arm tuck technique that hides the scar in the back of the arm. This arm lift technique also removes excess skin in the arm pit region. She mentioned that after weight loss, she developed loose skin, saggy arms and cellulite in her arms and other parts of the body. She wanted an arm lift, thigh lift and bodylift. She wanted all three procedures performed at one operation. She desired tight and smoother arms and a leaner body. For the body, she also mentioned that a tummy tuck was performed in 1999. 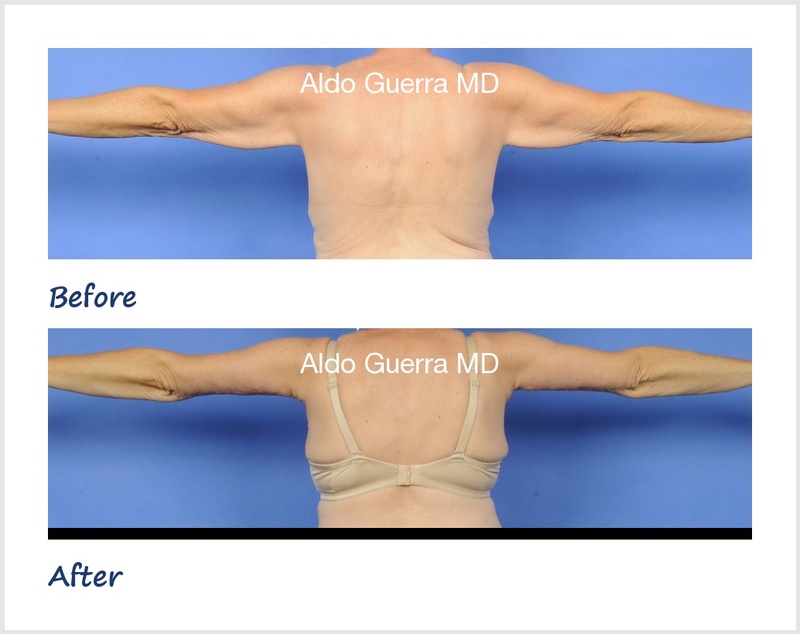 She was not happy with the results of the tummy tuck because she still had loose skin and the muscles were not tightened. She still had a "pooch". When I examined her, I found she had vertical and horizontal excess in the medial thigh that required an extended thigh lift. Before the cosmetic surgery, she weighed 130 pounds and was 5 feet 2 inches. A preoperative protein supplementation diet and bariatric vitamins were started. She had the plastic surgery operation in one setting and this included a bodylift with a vertical extension over the old gastric bypass scar. She also a lift of the inner and outer thighs and an arm tuck. She stayed 3 nights at the plastic surgery specialty hospital, with a pain pump, and experienced a comfortable recovery. 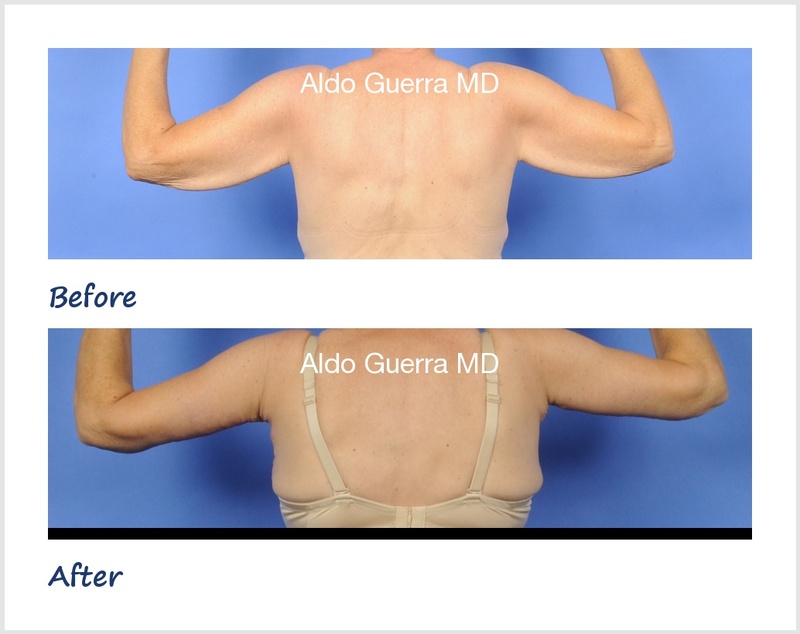 She is shown 8 weeks after arm lift and axillaplasty in the before and after photos.